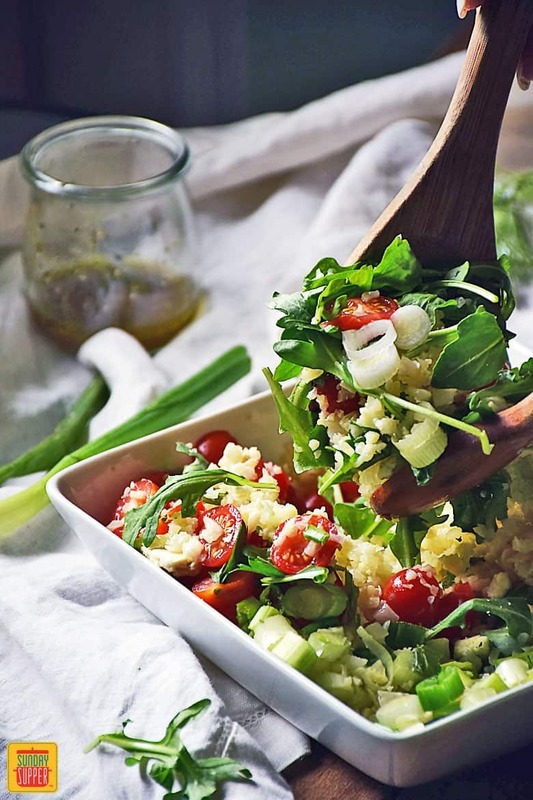 Our Greek Cauliflower Rice Salad is a healthy, low carb salad bursting with Greek flavors! Perfect for lunch or dinner as a side salad or main course. 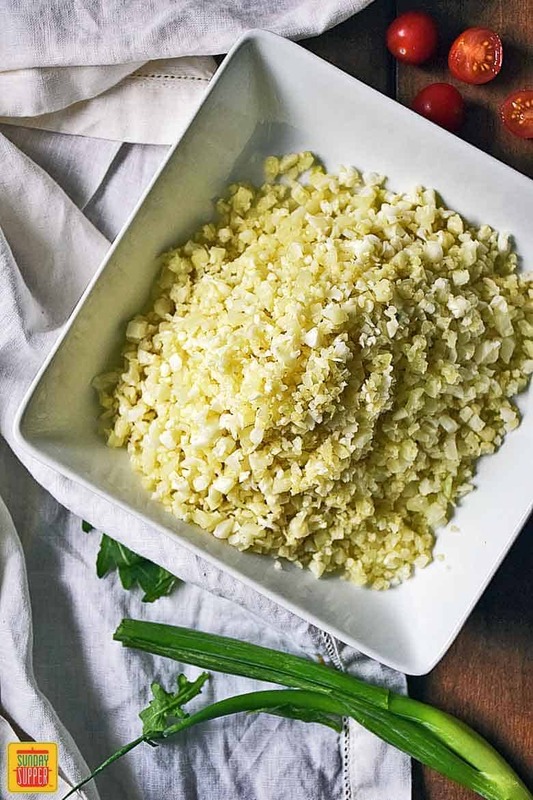 Cauliflower Rice is basically finely chopped cauliflower. It is so finely chopped it resembles rice. Cauliflower is a super versatile ingredient that can be used in a variety of ways as we showed in our article titled Creative Cauliflower Recipes. It is a low carb vegetable that can be used as a substitute for higher carb foods such as rice, pasta, and potatoes. Cauliflower rice is super easy to make using a food processor or you can even purchase it already riced in the produce section of your grocery store or you can even purchase it frozen. Using a head of cauliflower, remove the florets from the cauliflower relatively close to the stem. Discard the stem. The stem can add a bitter taste, so I generally don’t use when making cauliflower rice. Put the florets in a food processor and pulse until they are roughly the size of rice grains. That’s it! Now you have cauliflower rice. 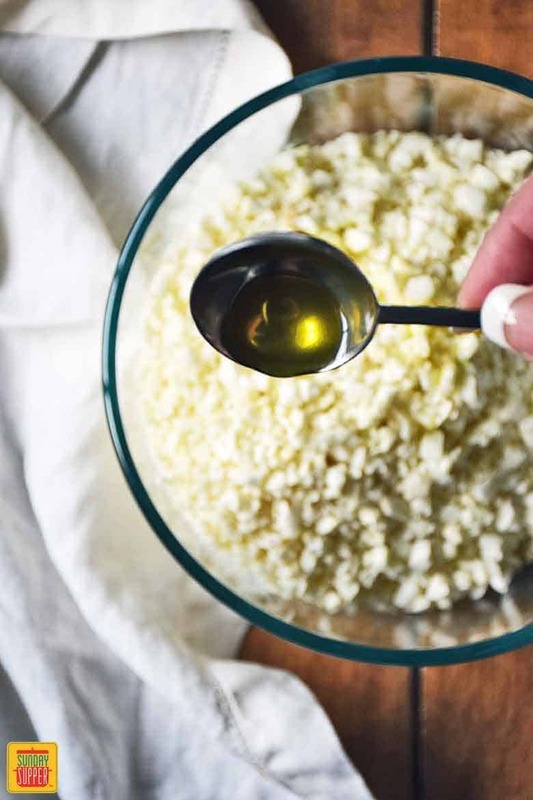 To soften the rice for use in recipes like our Greek Cauliflower Rice Salad, transfer the cauliflower rice to a microwaveable bowl and add 1 tbsp olive oil. Microwave on high, loosely covered, for 2 ½ minutes or until slightly softened. If you don’t have a food processor, no worries, check out an alternative way to make cauliflower rice in the microwave as explained in our recipe for Loaded Cauliflower Rice Casserole. 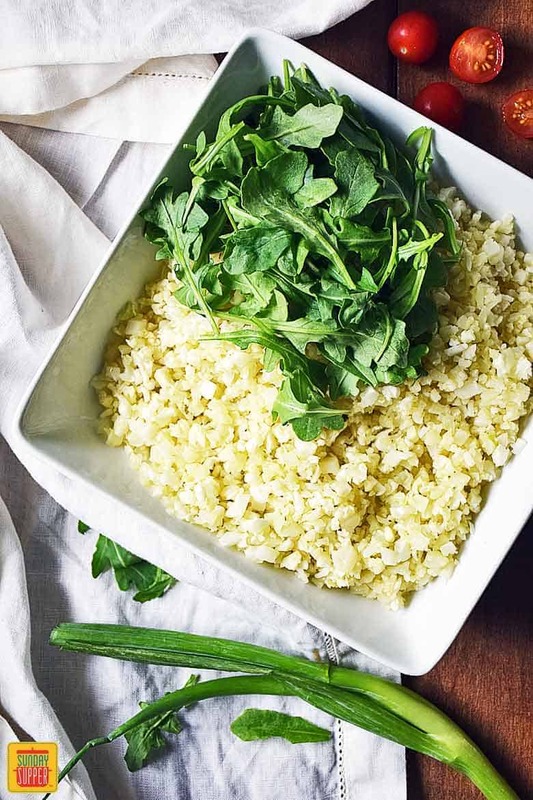 We LOVE this Greek Cauliflower Rice Salad! There are so many reasons to love it! 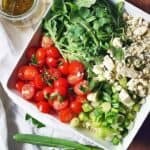 This cauliflower rice salad is PERFECT for a potluck or picnic as it won’t wilt like a lettuce-based salad, plus it’s fantastic for lunch and goes great as a side salad to just about any protein. It’s full of flavor, satisfying and healthy. This cauliflower rice salad is easy to make too, so really you have no excuse not to give it a try. We were certainly won over and hope you will be too. Give it a try with these Greek Style Pork Chops by Life Tastes Good. 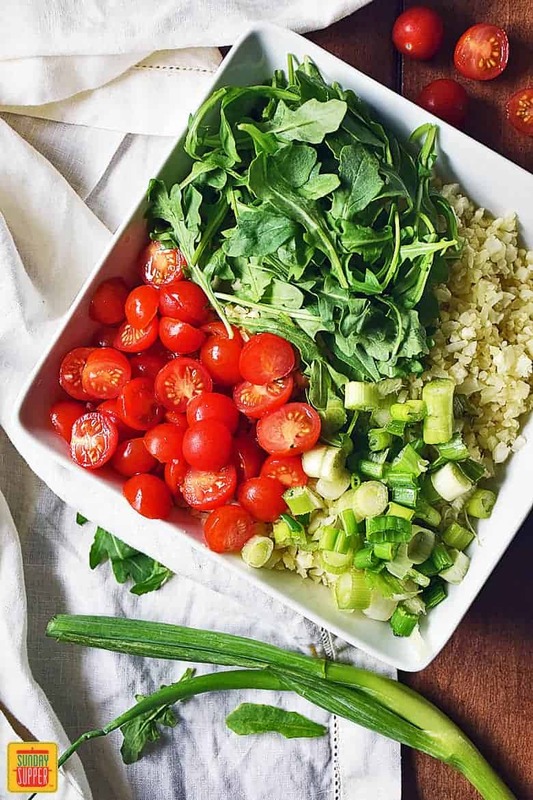 This cauliflower rice salad only takes about 5-10 minutes of prep time that includes ricing the cauliflower, slicing the tomatoes in half, dicing the green onions, and chopping the parsley. 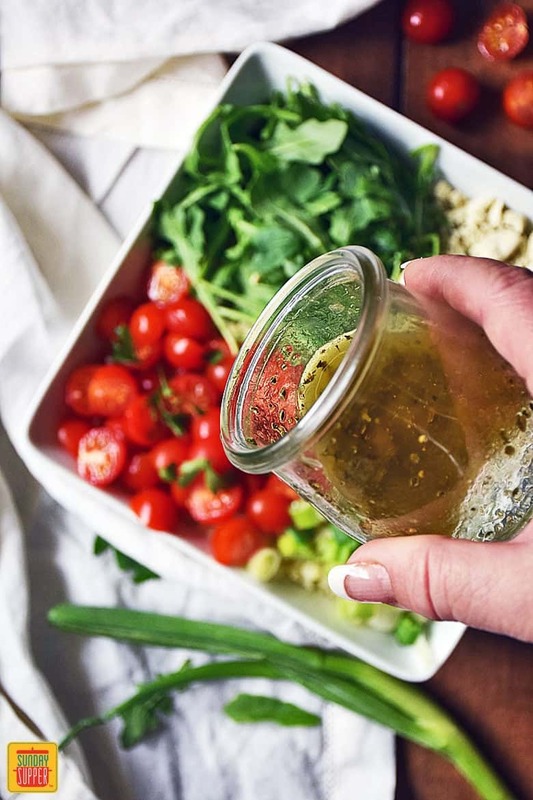 Once all of the ingredients are prepped it’s very quick to assemble the salad and whisk up the vinaigrette dressing. If using a head of cauliflower, remove the florets from the cauliflower relatively close to the stem. Put the florets in a food processor and pulse until they are roughly the size of rice grains. Transfer cauliflower to a microwaveable bowl and add 1 tbsp olive oil with a pinch of salt and pepper. Microwave on high, loosely covered, for 2 ½ minutes. Allow to cool while you prepare the rest of the salad. Top the cooled cauliflower with 1 cup baby arugula, 1/2 cup tomatoes, diced green onions, 1/2 cup crumbled feta cheese, 1/4 cup pitted olives, and 1/4 cup chopped fresh parsley. 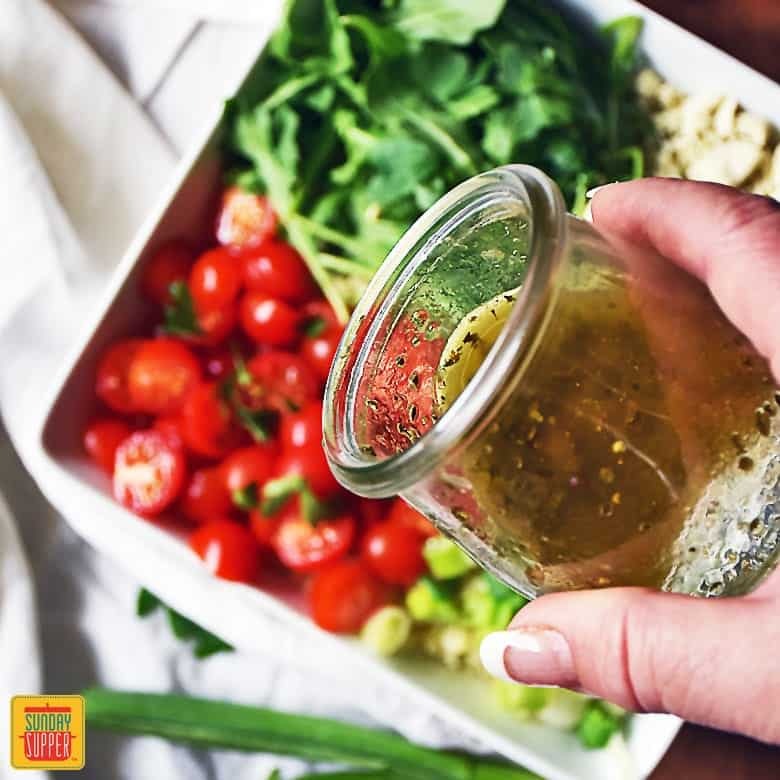 Whisk together 3 tbsps olive oil, 1 tbsp lemon juice, 1/2 red wine vinegar, 1/2 tsp dried oregano, and salt and pepper to your liking. Give it a taste and adjust the flavors as needed. 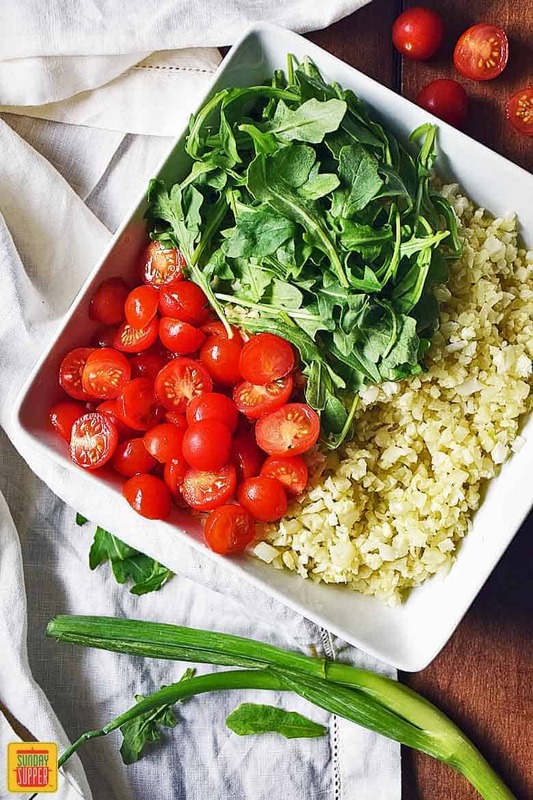 Pour over the cauliflower rice salad and serve. I’ve mostly seen cauliflower rice used in stir fries, but I love this Greek salad version! Can’t wait to try it – thanks!